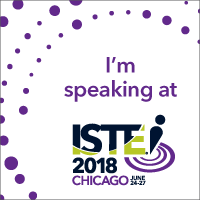 ICE18 Presenter: “PD Hack A New Way To PD” snapshot presentation. Midwest Fall Sumit Featuring Google for Education Presenter: “Engaging All Learners”. Focus on the UDL framework and connecting to ed.tech. and Gsuite tools. Presenter at D70i3 Conference: October 14, 2017. “Engaging All Leaners: A Tech UDL Mash-Up”. Learn about the UDL framework and how to leverage ed.tech tools to help remove barriers for struggling students. Google Innovator Academy Participant: August 2-August 5, 2017. Selected to join 35 participants in an intensive academy focusing on design thinking and innovation. Chicagoland Google Education Group Leadership Summit: July 14, 2017. Joined other ed.tech leaders in the Chicagoland area to plan and create opportunities for educators to innovate with technology. Presenter at Google Accessibility Week: October 11, 2016. Co-presented with Laura Palmaro and Nneka Johnson at the Googleplex in Mountainview, CA. “How Google Products Are Transforming Learning And The Classroom”. 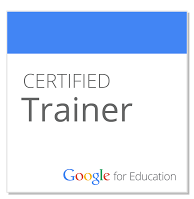 Google Certification Workshop: June 21, 2016 for teachers from Township High School District 113. Focus on skills and practical applications needed to complete Google level 1 and level 2 certification. CoSN Conference Presenter: April 4th, 2016 “What Not To Do With Technology”. Co-presented with Joe Taylor and Stephen Traphagen. Focus on a new way of looking at technology in education. Technology should be used as a tool to transform learning. Frameworks for ed.tech were outlined and demonstrated. Google Accessibility Workshop: December 8th, 2015 for selected teachers from Google.org and DonorsChoose. Co-presented at the Google offices in Chicago with Google accessibility program managers. Demonstrated the use of google apps, extensions, and add-ons in the classroom to leverage the use of technology for diverse learners. Google Education Training: June 11th, 2015 for staff at St. Gilbert’s School in Grayslake, IL Created training materials including a GoogleSite and GoogleClassroom class for staff to use. Taught use of google apps for education within the context of engaging students and good teaching practices. Looking for professional development to work cooperatively with your staff? Complete the form for more information.